If ever I was asked to name some unsung composers, Edvin Kallstenius would most certainly be on my list. He was born in Filipstad, Värmland County, Sweden in 1881. His early talent for music was nurtured in an artistic family environment that included painters, choral conductors and poets. He began his early life studying science at Lund University but later moved on to the Leipzig Conservatoire (1904-7). Around this time he fell under the spell of the conductor Arthur Nikisch and the music of Reger and Debussy. Schrecker’s opera Der Ferne Klang was also an influence (review ~ review ~ review). He forged a career as a librarian at the Swedish Broadcasting Corporation from 1928 until his retirement in 1946. Alongside this, he acted as treasurer to the Society of Swedish Composers (1933-61), and was on the board of the Swedish Performing Rights Society (1932-57). He died in Stocksund, near Stockholm, in November 1967. Despite being little known as a composer, and not being particularly prolific, he could boast five symphonies, eight string quartets, concertos for both the piano and cello and several other works. 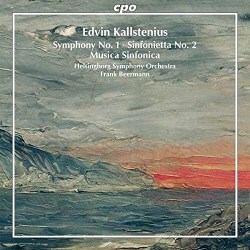 This is my first encounter with Kallstenius, though Rob Barnett has reviewed a CD of his music, which includes the Second Symphony (Phono Suecia PSCD 701). At first hearing his music seems to meander and have no structure or direction. It is only after listening to the recording several times that I discerned a logic and ground plan. It is written in a very individual and innovative style, utilizing imaginative harmony and intense melody. I was particularly struck by the unconventional way he resolves harmonies. For the performer his scores are notable for their meticulous detail and instructions. As a person, many regarded him as abrasive and obstinate, and this earned him the nickname of ‘Gallstonius’ (Mr. Gallstone). Kallstenius was forty-five when he composed his First Symphony in 1926, and it was premiered two years later in January 1928. He made revisions in 1941, and it is this later version which we have here. This three movement work is only twenty-three minutes in length, with the first movement being the longest at ten minutes. The opening movement is in sonata-form but displays a progressive tonal language. Throughout, major and minor keys alternate. The opening is dark, with a restless, angst-ridden quality pervading the music. It is quite dissonant in parts. In the second movement, the composer conjures up an almost eerie atmosphere, marked ‘Intermezzo malinconico’, using pizzicato. He adds to the tension by dramatic use of pauses. There’s a more sunny section in the middle, before the music returns to its initial melancholia. The rhythmically buoyant finale is more upbeat. For the most part it is a dialogue between the various sections of the orchestra, with each having its moment in the sun. Again, like the first movement, it is in sonata-form. The Symphony shows what an accomplished orchestrator Kallstenius was. There are four orchestral works called Sinfonietta in the composer’s oeuvre. This second one in G major was completed in 1946 and premiered in April 1950. Again in three movements, the first is relaxed and almost carefree. It is the tender lyricism of the second movement which caught my attention, with its underlying wistful calm. The finale is lively and vivacious with an almost march-like rhythm. There is a contrasting slower section in the middle. Following the three movement template of the previous two compositions, the Musica Sinfonica is a symphonic piece that started life as a work for strings, in 1953. The full orchestral version was finished in 1959. The first movement opens with a rather pointed theme, which gradually leads to a tranquillo section. Here, the composer employs a solo clarinet. The movement ends in a chatty way. The Adagio poco religioso is sombre and reflective. The short final movement has hints of Swedish folk music and is brilliantly orchestrated. The Helsingborg Symphony Orchestra under Frank Beermann have an affinity for this music, play with commitment and deliver inspired performances of these rich tapestries. Sound quality is second to none, with the Konserthuset, Helsingborg, Sweden providing an airy and resonant acoustic. I have returned many times to this excellent release over the past couple of weeks, especially to the symphony. CPO are to be commended for their advocacy of this long-forgotten composer. I sincerely hope that this is the beginning of a Kallstenius series. Booklet notes are informative, yet the translation from the original German is a little weak in parts.